Can Design-Build Save the BQE? 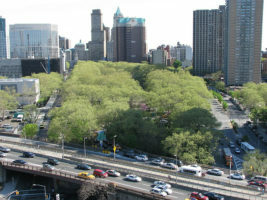 Last November, the New York City Department of Transportation (DOT) announced their plan to rehabilitate a 1.5 mile stretch of the Brooklyn-Queens Expressway (BQE). Early in 2016, the DOT hired experts to assess the condition of the BQE. They determined that though currently stable, rebar inside the concrete was starting to erode, which would inevitably lead to emergency repairs and closures. According to the recommendations, the estimated costs and completion time exceeded $1.9 billion and would take 7 years. In response, the DOT approached the City Council for design-build authorization to fast-track the necessary repairs. By employing a design-build project delivery method, it was estimated that the repairs could be completed in approximately 5 years, saving tax payers $300 million. Design-build is a method of project delivery in which a single company works with the project owner from start to finish. The company provides design and construction services within a single contract. Unlike the traditional design-bid-build model, design-build promises one unified workflow from the initial concept to completion. One of the more obvious benefits of employing design-build methodology is the reduced time frame for project completion. This form of collaborative project management permits the design and construction teams to work together, without intermediaries, allowing for faster delivery times on most projects. Design-builders often focus on maximizing efficiency instead of minimum design requirements allowing for cost savings and better project quality control. One of the biggest risks associated with any large project lies in the potential for lawsuit claims against project owners and contractors. Design-build projects can help mitigate that risk contributing to their appeal. By bringing an entire project under a single contract, project owners and builders can reduce risk, administrative burdens, and can limit or eliminate litigation claims. There are some drawbacks to the design-build method. With so much emphasis on efficiency and cost control, design-build projects tend to lack in quality design. If a high-brow architectural design is the primary draw of your project, design-build may not be the way to go. Another pitfall in this delivery method is the loss of independent oversight of a project. It’s typically the design team’s responsibility to monitor the quality of a build during the construction phase. With all phases of the project under a single entity, there exists the potential for a design team to overlook design requirements in favor of cutting contractor costs. It’s a conflict of interest that can create major problems later in the life of a project. In the case of the DOT’s BQE project, the State initially denied the City’s request for design-build authority. Currently, the State’s legislative body has ruled in favor of the traditional design-bid-build method but that hasn’t stopped City from pursuing the potential cost-saving measure. The City Council remains optimistic that they can pass a design-build bill after the summer recess and end this BQE traffic jam.